Nicolás Maduro’s workers’ paradise is literally enslaving its citizens. But, of course, there are no Canadian and Danish gulags. Then again, Canada and Denmark are not socialist countries. This is a truth the Left, and some of the Right, insists on refusing to learn. Canada in most meaningful ways enjoys a more free-market economy than does the United States, which is why our friends at the Heritage Foundation rank it several steps higher on their economic-liberty index. Denmark has a very free-market economy, too, though it is ranked one step behind the United States; Iceland is ranked ahead of Japan and enjoys a dramatically more free economy than is the Western European norm, ranked at No. 20 as opposed to No. 75 France and No. 86 Italy. The reasons for these disparities are pretty obvious: The Nordic countries have relatively high taxes and big welfare states, but they also have free trade, relatively liberal regulatory regimes, transparent and effective public institutions, etc. The United States gets dinged for crony capitalism and overly complex regulation. As Nima Sanandaji points out in these pages, four of the five Nordic countries have center-right governments, with the social democrats holding power only in Sweden. But even Sweden has undergone decades of reform in what would be understood in the United States as a generally conservative direction, as indeed did Canada a few decades ago. Welfare states are welfare states and socialism is socialism, and, in spite of the Bernie Sanders gang and the Right’s talk-radio ranters, they are not the same thing. Welfare states use taxes and transfer payments to enable higher levels of consumption among certain groups, usually vulnerable ones: the poor, the sick, the elderly, children. Welfare states are not synonymous with big government: Singapore, for example, offers surprisingly generous housing and health-care benefits despite having a public sector that is (as measured by spending) about half the size of our own and a little more than a third the size of France’s. Switzerland has a fairly typical portfolio of welfare benefits (including a health-care system that is approximately what Obamacare was intended to look like, if Obamacare hadn’t been written and enacted by fools) with a public sector that is smaller than our own. You can view the data and make your own comparisons here. Socialism, as I have written at some length, is a different beast entirely. Like the welfare state, it involves the public provision of non-public goods, but it achieves this in a different way. Rather than levying taxes and distributing checks or vouchers, the socialist government owns and operates the means of production, or, in the corporatist variant, puts the means of production under political discipline effectively indistinguishable from government ownership of them. The easiest example to illustrate the difference here is in American education: The Right advocates a welfare-state approach, with government funding education costs through taxes which are passed on to families with school-age children in the form of vouchers, which can be used at a variety of different kinds of institutions serving a variety of different kinds of needs; the Left, in contrast, advocates the truly socialist model, with government owning and operating the relevant economic assets (public schools) which function as a monopoly. The fact that you can send your children elsewhere does not make them less of a monopoly: Stop paying your school taxes and they’ll still send men with guns to your house to force the money out of you, to seize your home, or to cage you until you comply. Violence is always at the end of the socialist enterprise, as the poor people of Venezuela are discovering. Our friends on the Left assured us for many years that Boss Hugo and his epigones in the regime of Nicolás Maduro were democratic socialists, not the mean Stalinist type, and the praises of that so-called democratic-socialist regime were sung by everyone from Democratic congressmen such as Chaka Fattah of Philadelphia to progressive celebrities such as Sean Penn. The democratic socialists in Venezuela have just introduced slavery into their workers’ paradise. The Chávistas, like Hillary Rodham Clinton and Donald Trump, believe that international trade isn’t the open and mutually beneficial exchange of goods and services between people operating in open international markets but a nefarious scheme in which domestic workers are exploited and ripped off by ruthless foreigners who want to . . . sell them useful and desirable goods at low prices. (Never mind that for the moment.) Like the “Buy American!” gang here and the juche-practicing Norks, the Chávistas advocate a form of autarky, a system under which a country produces what it needs and consumes what it produces with minimal international trade, under the theory that such international trade impoverishes people. (They have never heard of Singapore, Hong Kong, or the United Kingdom, apparently.) So the Chávez and Maduro regimes enacted various kinds of controls on foodstuffs and other essential goods that sought to control prices and restrict international trade. Soon, the shelves of the grocery stores were empty, and Venezuelans couldn’t even buy a roll of toilet paper. 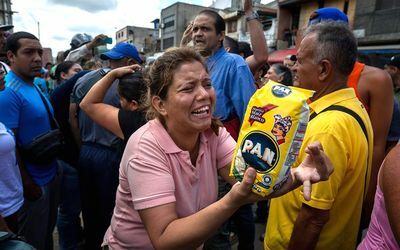 The food shortage is especially severe right now, so the Maduro government has just passed a decree empowering itself to conscript workers — public-sector or private — into the state’s collectively run farming, food-processing, and food-distribution businesses. The pattern here will be familiar to those familiar with the history of socialism in Russia and China. That’s right: It’s not the socialism, it’s just that socialism has never been done right. Weird thing: That feckless and authoritarian kind of socialism is the only kind of socialism anybody has ever seen or heard of outside of a college dorm room. Either socialism is the unluckiest political idea in the history of political ideas and it just happens to have coincided with government by monsters, caudillos, and incompetents every place it has been tried, or there is in fact something wrong with socialism qua socialism. Why is it that the big-government Danish welfare state, the small-government Swiss welfare state, the frequently illiberal Singaporean welfare state, and the nice-guy Canadian welfare state all seem to work, each in its own way, while socialist experiments — including the so-called democratic-socialist experiments of places such as Venezuela — go speeding down F. A. Hayek’s road to serfdom? The critical difference is that entrepreneurship and markets are allowed to work in a welfare state — and to work especially well in welfare states characterized by public sectors that, while they may be larger or smaller, are transparent, honest, and effective. The U.S. food-stamp program has its defects, to be sure, but it’s a great deal more effective than was Soviet collective farming and state-run groceries. A dynamic capitalist economy such as Switzerland’s or Singapore’s or Canada’s can carry a lot of welfare state. But it cannot really carry all that much socialism. The great American socialist experiment — the government school monopoly — is a shocking failure. The government’s attempt to operate a socialist pension system is collapsing and will never pay out its promised benefits at their real present value. For years, American farming was hobbled by federal attempts to manage agricultural markets, with tons and tons of so-called surplus grain left to rot in the name of rational economic planning, converting a period of agricultural abundance that would have merited its own religious myth if it had happened 4,000 years ago into a national economic catastrophe. When one of our so-called progressives looks at a Nordic welfare state, what he always says he wants to replicate here is the relatively high taxes and relatively large public sector. It’s never Sweden’s free-trade policies, Denmark’s corporate-tax rate (which is far lower than our own), or Finland’s choice- and accountability-driven education system. When the American Left expresses its envy of Western Europe, it’s never Switzerland’s minimum wage ($0.00) it wants to reproduce, only bigger and more rapacious government. But the relatively large Danish public sector does different things than does the U.S. public sector, and it does them differently. A larger U.S. public sector would be a great deal like the current U.S. public sector — ineffective, captive to politics, corrupt — but bigger. If you want to see what so-called democratic socialism looks like, turn your eyes south to Venezuela and its new slave-labor camps. What’s happening in Canada and Denmark is something else — something that is much more in tune with the approach and priorities of the free-market/free-trade Right, or at least what’s left of it.